Valerie: Today is the 9th of August 2016, and we are gathered here in Moss Vale, in Australia. 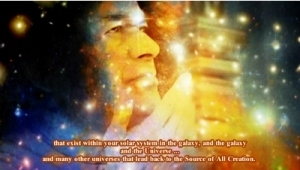 We call – with great love and great respect – upon Cosmic Sai Baba to make His Presence among us. Thank you. ❝I am here! And I am very pleased to be here. I have been waiting … knowing that we could not meet at our normal time. And I have organised things – and called upon my assistants to help me – and organise a time so we may have this transmission, which is now. So, Thank you! Thank you to those that are here, for being present, to hold the energy, and to welcome me to speak from this place that I come from. I have spoken many times (and told) that I come from the World of Light. And you can see that in your mind if you like, and think about the world of light. It is a place that your soul comes from! For that is the person who you really are. Or, the soul you could think of as someone that is guiding you, because you have agreed to a life – with a role – and with meeting certain people on this Earth and in this life and the personality that you are now. Your soul has been many personalities, not only just this on this Earth planet. Your soul has been in many other dimensions and on other worlds as well. Our focus – of course – is upon Planet Earth. Where you meet many other souls that have come from many different places within the universe and other universes. They come with a different history. They come because it is an opportunity to live in an Earth body and experience – experience much – upon this planet. They come to experience emotions – that are very difficult at times. For when you think about the times of difficulty – once you move on – you find that you become stronger. You will gain from that experience, although it may be difficult. Some people that have come as souls upon this Earth have never experienced pain; and this is something that might be considered. It is not a happy experience. But it is a way of understanding when – something is experienced – in your Earth body and you feel it. That is the secret; the feeling is the important thing! Because some – that have come from another place, another planet – do not have that. They do not feel. They have no idea about pain or suffering. They can blissfully live in a world – they can experiment – and do many things – that are not really acceptable in the World of Light – from the Universe that you are in at this present time. This is not a judgement, this is how it is. And so, if you meet people and you see they are having troubles adjusting to this life upon this Earth, I would ask you to help them. Because you have been – most of you – here many times upon this Earth. And you have experienced many different emotions. And the emotions that you take when you leave your physical body, your Earth body and move to your spirit body. These emotions stay with you and they still need to be healed, at times. For, shall we say, the bigger picture is for you to understand this experience and then you can grow! If I can put it in several ways – simple ways – of who you are. Your journey here on Earth is to help one another, and also to learn to love yourself. To love yourself. Because when you love yourself totally – without any judgement – you can very easily – from the energy that you walk in – you can help other people. Others too, also help to free themselves from attachments that they hold, because of judgements that they make upon themselves and so they free all inhibiting energies and Be. Just be a Loving Being. So, I have not come to preach, today. I welcome the opportunity to come, as I have been telling everyone. To speak, and to know that I am welcomed. So I am leaving now, but not leaving. In other words – if you want to call upon me, please do! I have many assistants – but I am also omnipresent – so you can find me in your hearts. So remember that, remember that. Yes, remember that. God Bless you my children, God Bless you. Thank you.